Sometimes it’s easier to make quick changes directly from the GitLab interface than to clone the project and use the Git command line tool. In this feature highlight we look at how you can create a new file, directory, branch or tag from the file browser. All of these actions are available from a single dropdown menu. From a project’s files page, click the ‘+’ button to the right of the branch selector. Choose New file from the dropdown. The ability to create a file is great when the content is text. However, this doesn’t work well for binary data such as images, PDFs or other file types. In this case you need to upload a file. From a project’s files page, click the ‘+’ button to the right of the branch selector. Choose Upload file from the dropdown. From a project’s files page, click the ‘+’ button to the right of the branch selector. Choose New directory from the dropdown. 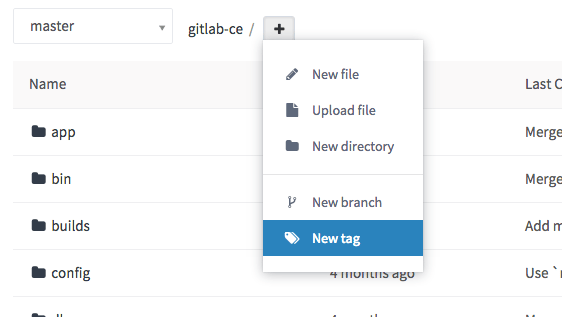 There are multiple ways to create a branch from GitLab’s web interface. If you want to make changes to several files before creating a new merge request, you can create a new branch up front. From a project’s files page, choose New branch from the dropdown. You can now make changes to any files, as needed. When you’re ready to merge the changes back to master you can use the widget at the top of the screen. This widget only appears for a period of time after you create the branch or modify files. 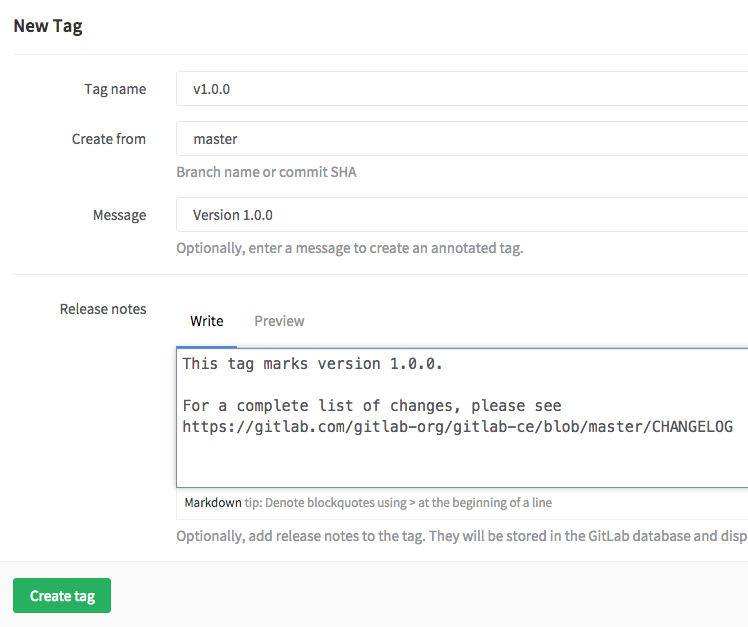 Tags are useful for marking major milestones such as production releases, release candidates, and more. You can create a tag from a branch or a commit SHA. From a project’s files page, choose New tag from the dropdown. If you’d prefer not to use your primary email address for commits created through the web editor, you can choose to use another of your linked email addresses from the User Settings > Edit Profile page.